The modern world dictates its own rules. And our success largely depends on our dress, people judge by appearances.. To get your wardrobe good-looking quickly and without trying hard there is quite a useful device – a garment steamer! By using the garment steamer, it’s possible to get the clothes ironed by touching neither an iron nor an ironing board, restore the shape of the garment, making it magnificent and silkiness, and even remove unpleasant odor. In addition, a hot steam disinfects fabric, gets rid of dust mites and bad bacteria, removes stains without recourse to the laundry or using the removers. Now the clothes made of synthetic fabrics don’t receive a burn and shaggy cloth would be looking fancy as the steamer doesn’t make pile crumpled. Fur and faux fur will do duty a couple of years longer, not only does the steam not spoil fur, but does refresh. Rhinestones, beads and sequins will never come off your dress, the outfit becomes smooth and elastic. There are several types of clothes steamers nowadays, and it can be confusing a bit when you’re looking for a new one. Therefore in this section, we’ve broken out the different types and what features they have. Handheld as well as Portable steamers are very handy and have got a tiny size. They can be taken in a long journey and any trips at the expense of their simplicity and compactness. The water discharge of this “right-hand man” is about 0.44-0.68 oz per minute and its thermoelectric heater is exactly the same as the usual kettle one. The complete equipment can include attachable fabric brushes for cleaning various types of particles such as lint and hairs; a pants press - an attachment that keeps a crease on trousers or skirts; a protective glove made of teflon or a special fabric. ​The typical handheld steamer consists of a body with a built-in water tank, a steam nozzle and a filling beaker. They are mobile and ergonomic in usage. Various models can have a water tank capacity from 17 to 101 oz, this is what the time of continuous steaming depends on - 2 hours steaming requires 2 litres of water. The devices power is 500 - 1750 Watts. If you are looking for a compact handheld steamer just to remove a few light wrinkles the Epica is a good choice. It’s very compact so storing the device won’t be an issue. This size is perfect for travel, the Epica would be your ideal traveling companion! Portable garment steamers are generally pretty cheap, the Epica model is ultra cheap! So, if your aim is buying something cheap and cheerful as well, this one could be your best option. Lightweight. Let’s count the total weight of the fully equipped Epica. The housing itself weighs 2.1 pounds plus 0.44 pounds (7 oz) of water and we have merely 2.54 pounds in total! That’s great as your hand won’t feel tired at the end of steaming (it’s not hard to hold the steamer in one hand even for girls). Compact. It’s 7 ¼ inches tall and 4 ¼ inches wide. That’s good if you don’t have much space for storing the device at home. Moreover, it can be taken in any trip. Accepts tap water. One more good news is that the Epica can be filled with tap water whereas some other steamers can require distilled water. You don’t have to worry about water specification. On/Off switch. The Epica comes with the on/off switch for convenient control which also adds safety while some competitors must be unplugged to stop working. Long cord. The cord is roughly 10 ft. in length - it’s almost twice longer than an average iron has. Feel free to move around with the steamer in your hand! Economical price. We saw the Epica at a price of 20$ on sites like Amazon! Investing in this product will definitely not cost an arm and a leg. This is the solution we recommend for people who may be tight on budget. Easy to use. To use this item simply put the article of clothing to any convenient hanger or hook and run the steamer up and down the item. Does work on jeans. The Epica is good at t-shirts made of cotton and polyester and dresses from delicate fabrics. But not only can you steam light fabrics, but you can get the wrinkles out of jeans! Don’t expect the perfect crisp look as a result, but the wrinkles will be taken out. 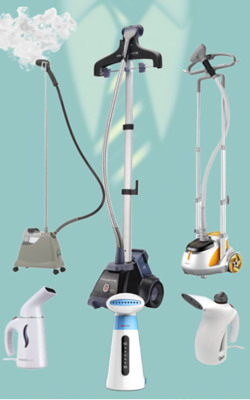 While the Epica 800 Watt is a very useful and versatile fabric steamer, it can have defects. If you decide on buying this item, don’t wait long after getting the device and test immediately. The most well-known defect is overheating and, as a result, spitting water everywhere. Also, make sure not to overfill the water tank, otherwise, you could get the same problem. If you find any issues, you can request a replacement with no problem - the Epica provide a good service. It is hard to believe that something this small can deliver so much raw power, and so much steam! But it is true, the new Pure Enrichment PureSteam Fabric Steamer is at the top of its game, decreasing and refreshing your clothes in a fraction of the time it would take if you were to roll up your sleeves and start ironing! This product features the unique design that is tailored to make to use easier and to make your steaming a breeze! Elongated nozzle covers more surface, allowing you to finish steaming your shirts sooner and better! Once you plug it in, this steamer takes only two minutes to work its magic, and it holds enough water for ten minutes of continuous steaming! It works great on all fabrics so you can steam your clothes, drapes and even carpets to remove odor from them! Also, keep in mind that this baby is great for refreshing upholstery on your furniture. Breathe new life into your couch covers, or freshen up you upholstered chairs in only a couple of minutes! The best part of this great product is its affordable price! Small compact clothes steamer that makes your life easier at a fraction of the price of professional steaming products! Easy to handle – this excellent product offers ease of use for even the most inept and tech un-savvy individuals! Simply pour in some water, plug it in and wait two minutes until it is ready to work its magic! And that is it! Has warranty – this top notch product has a two year manufacturer’s warranty, which means that you can rest assured that this quality product is backed up by the manufacturer and if anything goes wrong, you can contact them for a satisfactory solution! Compact and packs well – small size of this product enables you to store it without a problem. It takes very little space and you can rest assured that you will not be tripping over it. It also packs extremely easy, and you can carry it with you anywhere you go, eliminating the need to lug a heavy iron around with you! Affordable – for something so powerful and high-end, this product is extremely affordable, selling at a fraction of the price that other steamers of its class sell for! Stationary steamers are bigger and really good at steaming the clothes. They safely stand on the floor and are often supplied with reinforced poles giving the ability to steam by far more clothes at one time. The stationary steamers are specially designed for vertical Ironing. ​Complete set of stationary steamers usually consists of a housing, a visible tank for heating water, a comfortable handle, the steam hose and ironing brush, a measuring cup and an adjustable hanger. The Jiffy J-2000 is a high-quality product manufactured by the world's oldest and largest company specialized in steaming equipment. The steamer comes with 1300 watts of power, a minute ready-to-use time and a huge 0.75 gallon tank. Each fill allows you to use the steamer for an hour and half! This steamer is good for home and light commercial use. To choose the right steamer head, you should take into consideration their advantages and disadvantages. Let’s have a look at the construction. The steam hose is made of a really nice material that is always flexible regardless the temperature in the room. It has nice brass fittings, aluminium rod, a good canister that’s very easy to fill. The housing is made of a durable plastic. Jiffy thought about everything! There is a nice little handle at the bottom of the water tank that makes it easy to carry back. On/off switcher with a green power-on light. Can be easily triggered with your foot! Does not overheat. Shuts off automatically when water is run out! Tap water or 50/50 mix with distilled water can be used. Easy to use. Just hang your article of clothing on the rod and move the steamer head up and down. The Jiffy J-2000 is a high-grade product for de-wrinkling your clothing and reducing the time you need for ironing. The only thing we can complain about is the price of the product - it is a bit stiff, really. The plastic head model costs from 150$, the metal head one is more expensive. But we are sure this steamer costs every penny because it does its job expertly! You cannot lock the wheels on the bottom and it could be an issue in case you have a smooth floor. Putting over carpet can solve the issue. First 1-2 days of using, the steamer can produce not the full amount of steam - there is a break-in period. Don’t worry, just let it take a run. The Jiffy J-2000 looks old-fashioned. It does not have any attachments or a hanger (unless you buy the metal head model with wooden one). But if the durability and quality are your top criteria, if you are ok with the price, this steamer is your best choice! Most of the owners wonder why they didn't buy their Jiffy J-2000 earlier. We believe you can't go wrong with this product. Rowenta keeps making millions of people happy by their high-quality domestic appliances and inventive technologies. And the Rowenta IS6200 steamer is an apt example! If you are looking for a reliable and first-rate quality steamer that will be able to iron a large number of clothes quickly, this steamer is the right solution! At the medium price, you get a new weapon in your household arsenal! The Rowenta IS6200 has a telescopic pole by which you can change the height of the hanger, setting the most comfortable position for you. There is also a variety of accessories: crease attachment, fabric brush and lint pad. The big advantage of this steamer is a large removable transparent water tank giving the continuous steam work for the whole hour. In addition, there is a clothes hanger, the foot on/off switch with indicator for a more comfortable use and large wheels allow for easy mobility. The foot-operated on/off switch with light in front and large back wheels add convenience in usage. The telescopic pole for adjusting the height and collapsing for compact storage. Automatic shutting off if the tank is runs out of water. Equipped with plenty of accessories: a crease attachment, a fabric brush and a lint pad. Now you can smooth out a sophisticated evening dress quickly and easily! Heats up really fast and is ready for use in 1 minute, works quietly. Ideal for de-wrinkling ruffles, flounces and laces. An evening dress with lots of pleats and laces can be steamed out within 15 minutes. You can iron the curtains right on the ledge! A built-in hanger with garment clips and hanger hook is included so you don’t have to buy a hanger separately. It is very easy to put together and use! The steamer has everything for your comfortable use: adjustable telescopic pole, moving the back wheels, soft handle, a large water tank. Accepts tap water. The water tank may be filled with both tap water or distilled water. Beautiful design, looks just perfect. High-quality product that ensures durability. So, it’s time for the complaints procedure. The steamer is about 5ft in height and we like most of the owners wish it was taller. This height is close to average for stationary steamers, but it will be a problem, especially if you are tall enough, so you will almost have to sit on the floor to steam.There is some kind of workaround if you are ok to hang the clothing upon a door/doorway and steam it this way, then the height of the hanger won’t bother you. If no, we’d recommend paying attention to the higher models. One more thing we noticed about this steamer in use is that after about 15 minutes of usage the steam head gets hot. This is why we recommend wearing any protective gloves when you are steaming for a long time. Professional steamers have the most solid housing from all types of steamers which is good as it increases their expected life. These heavy-duty steamers are suitable for commercial or home use because you can get the clothing looking presentable not even taking off from hanger! Some professional steamers implement the Steam-On-Demand technology so you can pause the steam if necessary. One more cool feature the industrial steamer can have is the Dual heat technology which provides faster and hotter steam for better results. If you are a simple person that doesn't want to spend money on both, good iron and high-quality steamer then you need to look at this bad boy. PureSteam Duo offers both sides of the medal for a fair price and people simply love it. Pure Enrichment is the well-known manufacturer that made many lives much simpler by combining two products that go really good together. If you are battling smaller space in your apartment and you don't have the luxury or don't want to create a cluster in your living space PureSteam Duo will be the perfect solution for you. Since this product offers service of a good iron, with built-in ironing board and great steamer you can forget about wrinkly clothes. Water tank - Even though this product has many options, the one we noticed first was a water tank. PureSteam can handle up to 1 liter of water which will make you steamer last for quite some time. And the constant refilling won't be necessary. Long Cord - There is nothing more annoying then short cord that really shortens your maneuverability. Fortunately, PureSteam has a 6-foot long cord that will allow you to handle even the largest pieces of your clothes or even sheets. Compact design - When talking about product combos people tend to think that they use too much space. But, PureSteam is made to counter that common thought. Even though it might be a bit tall, PureSteam is really thin and can fit behind any door or in any closet. Versatile - although PureSteam is a duo product, that is not the end for the great features it can offer. The best thing about it is the easy and simple temperature regulator which allows you to use it on any type of cloth. Forget about burning you a favorite blouse or wearing still wet trousers. Warranty - Pure Enrichment really likes their PureSteam and believe in its functionality, and if by any chance something comes up and your product has some issues they will be more than happy to help you out. Pure Enrichment offers to any buyer their personal 5-year warranty which is quite awesome! Accessories - Additionally, not only will you get a great iron and steamer combo, you also get a few things that will make the whole collection in one place. With PureSteam you get Hanger Hook, Clothes Hanger, Fabric Brush and Iron Holder. Fast heat up - If you are in a hurry PureSteam will be ready for usage only after 3 minutes that was turned on. This makes your mornings less stressful and gives you more time to prepare for the important things that await you. Here is another excellent Kazoo product, this time, a powerful cloth steamer that shaves hours off of ironing chores! How many times did you iron your clothes and placed them in your closet, only to find the creased and wrinkled up again in the morning? And how many times did you have to repeat that tedious ironing process? Well, no more! With Kazoo things get infinitely easier! Simply take your clothes out of the closet, give them a quick steam over and watch them de-crease in front of your eyes! This great product is both practical and cleverly designed, allowing you to steam garments right there on the included clothes hanger! The water tank is detachable from the base and easy to refill, plus it has wheels on it so you can easily transport it around the house! Use it to steam your clothes, drapes, carpets and upholstery with exceptional ease and wonderful results! This garment and fabric steamer comes with an included clothes rack and a huge water container that hold close to 46 oz. of water! This means that it can steam without interruptions for 40 minutes! Now to put that in perspective, 40 minutes of steaming means you will be done with nearly 10-15 shirts in no time! Try ironing 15 shirts in 40 minutes. Can’t be done! 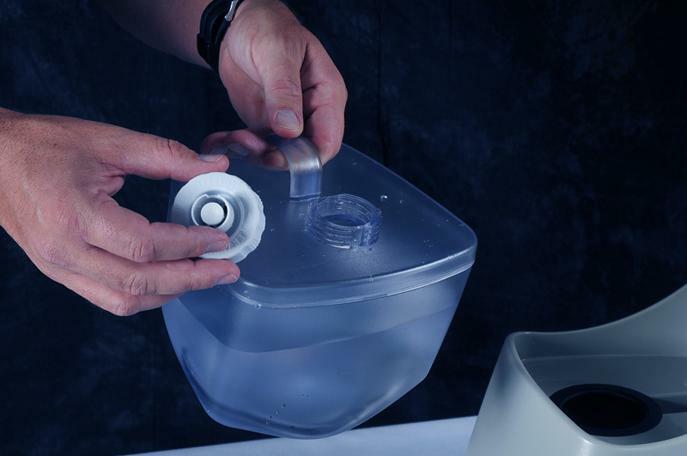 The water container is translucent so you will be aware when the time comes to refill it! There are four power settings you can use, depending on the fabric you are steaming. Use lighter mode for delicate fabrics and turn the power up when you are steaming carpets, drapes and upholstery! Use the maximum power setting to steam your bedding and get rid of those nasty bed bugs! The power cord is retractable and folds under the unit for easier handling. The entire device is very compact and will fit inside a built in closet or a cupboard without a problem! Kills germs and mites – this excellent steamer helps you get rid of mites and germs, and highly pressurized steam at high temperatures will kill those nasty buggers in an instant! This is especially good for everyone that suffers from allergies, as it helps keep your clothes clean and free of allergens! Multiple power settings – 4 different power settings allow you to control the output and the temperature of the steam, adjusting it to the materials that you are steaming and making sure that no steam-related damages occur. Automatic shut-off – whenever the unit is left without water it shuts itself down to prevent damage to itself and to the fabrics. This is great as it save the life of the heater, and extends the life of the machine! Guarantee of quality – This product has a 2 year limited manufacturer’s warranty, making it an excellent buy since you can rest assured that if anything happens to it a replacement is ready and waiting! This excellent Kazoo steamer sanitizes everything it comes into contact with and helps keep your clothes crease and wrinkle free! Make sure to order it now at an affordable price and forget about ironing! Keep in mind to follow the instructions and to clean it regularly to ensure its serviceability for year and years! This excellent semi-professional fabric steamer comes complete with a hanger that allows you to hang your clothes and quickly and efficiently steam the creases and fold away! Dual-telescopic bar ensures the stability of the hanger and allows you to adjust the height for ease of use! SALAV steamer comes with a translucent, removable water tank that is easy to fill and holds 60 oz. of water at a time, which allows you to steam continuously for over an hour! It only takes 45 seconds to heat up and then you are ready to go! The base is fitted with cast wheels that will enable you to move easily across hard surfaces and carpeted areas! The unit is equipped with two ergonomically placed foot pedals that allow easy control of the product and are durable, so they will not easily break. The electrical cord is of the sufficient length, so you will not have the added hassle of dealing with the extension cord. The steam output of this product is exceptional, and the pipe is doubly insulated to help keep the steam output constant and temperature adequate for professional steaming! Includes additional accessories – this steamer comes with additional accessories, such as a pants press, a mini ironing paddle, a fabric brush and two hanger clips, so it is very convenient to steam different types of garments and fabrics. Integrated hanger – this feature makes it easy to simply hang up your clothes and get steaming. It is convenient for shirts and coats, and makes it convenient to quickly get the job done! Power control – this product allows you to adjust the steam output, meaning that you can steam more delicate items on a lower setting without the fear of damaging the fabric, and you can crank up the power for more resilient fabrics, such as upholstery, and mint them up in an instant! Modern look – elegantly designed, this steamer is an excellent addition to any home, seeing that its sleek features will fit right in! It looks like something out of a Sci-Fi movie, and can be a great conversational piece! Hours of steaming – the large water container provides you with plenty of steam and when full it will work for an hour without the need to top it up! This great steamer will save you hours of your time you would usually waste ironing! Make sure to regularly clean it, especially if droplets start coming out of the nozzle! Just rinse it with a vinegar solution and that is it! Keep in mind that the red light means lower setting, and for more power put it on orange mode! At this point, you know all benefits of using a steamer for clothes. It’s faster than an iron and better for your fabrics. It won’t put a burn on your good clothes and it gently steams the wrinkles out of delicate fabrics. To choose your best steamer, you should rely on the reviews and follow some common rules. THE MORE POWER THE UNIT HAS THE MORE STEAM IT GENERATES, THUS THE BETTER IRONING YOU HAVE. Steamers that have the power up to 1500 Watts spend about 0.67 oz of water per minute, these are economical ones. More powerful steamers can use 1.7 oz of water per minute that make them more professional machines. A BIGGER WATER TANK PROVIDES LONGER WORKING TIME WITHOUT REFILLING. This parameter is especially important in commercial use, as in this case the steamer should handle a lot of clothes. PAY ATTENTION ON THE TIME NEEDED TO HEAT UP A WATER AND BE READY FOR USE. Some units are really fast, they heat up in a few seconds, whereas the other ones can take up to 15 minutes. This is important if you don't have much time or don't want to spend extra time on ironing. HIGH WATTAGE MEANS A LOT OF ELECTRICITY USAGE. As you already guessed this increases your utility bills. Keep this in mind especially if you are looking for a heavy-duty steamer. THINK OF THE SIZE IN ADVANCE. Keeping the steamer assembled is more useful so you can turn it on and start steaming at any convenient time. This is why you should think of the device size and a place at home where you are going to store it unless you are looking for a travel model. These are so compactness as you can put it into a bag and don’t worry at all. CHECK THE WATER TYPE REQUIREMENTS. Make sure to find out what kind of water is required for a particular model. There are 2 options only - unfiltered tap water or distilled water. The cheaper devices usually have excessive requirements to water, as a rule, you have to fill them with distilled water. More expensive steamers are ok to work on usual city water. it is easier to use undistilled water, without thinking about the consequences. TRY TO STEAM SOMETHING AT ONCE YOU GET YOUR PURCHASE. No wonder, steamers can be defective. This is why you should try it out just to make sure everything is working ok. If you find something broken, you will have enough time to return your purchase with no issues.